I’ve decided to get my act together and go for a writing career. Don’t worry. I’m still going to illustrate and create art but I’ve wanted to be a published writer for as far back as I can remember. I’ve even had limited success in the past writing for a music magazine. I’ve also written web content and flash fiction that has gotten picked up. But after those small successes I never pushed harder. Now’s the time. 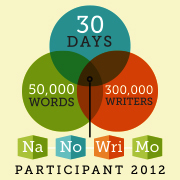 On November 30th I finished National Novel Writing Month’s challenge to write 50,000 words in one month and I cried. I was so proud and happy and accomplished. So now I am firmly of the mindset that writing is where it is at! Step 1 is getting this blog going for real this time. There will be a multitude of posts from now on ( I hope.) And I will tell you about step 2 tomorrow… Wish me luck. I’m off to read a bunch of helpful tip sites. I will report back on what I find useful. Posted on December 5, 2013 by 1fuzzymonster. This entry was posted in rambles, writing and tagged nano, nano winner, nanowrimo, novel writing, writer, writing. Bookmark the permalink. Good for you. Do you know what genre/style compel you most? I love fiction of all sorts but I am a supernatural girl. I love werewolves, demons and magic.